We talk to Jessica about body image and how she overcame her insecurities. I was a really athletic, bubbly and bouncy kid. At the age of nine I was outside at home playing with my older sister when I tried to balance on a soccer ball, fell off and fractured my femur. I had to have massive surgery and over 6 tough months of rehab and it still wasn't healing, it was then they discovered that I had bone cancer. I went through intense chemotherapy before it was decided that I should have an operation called a rotationplasty, a very rare amputation. After that I got my prosthetic leg and that started my next chapter. It was tricky as a young child, thinking that I could run, bike ride and do all the things other kids could do. Most things I had to learn again, starting with learning to walk. Growing up not being able to do the things I wanted got me down, so I've had to find new ways of doing things. I'm still trying to figure it out now, it's one of those ongoing things. I graduated with a Bachelor’s in Art and Design 2 years ago and I’m currently working fulltime as a product designer in the textiles industry as well as juggling Limbitless and the recent success of my Instagram. I also mentor and support cancer patients and amputees as they undergo treatments and recovery from limb loss. I do it because it's just such a complicated surgery, and it's something that's really difficult to wrap your head around. Having someone who’s been through the experience telling you that it’s going to be ok is a big help. 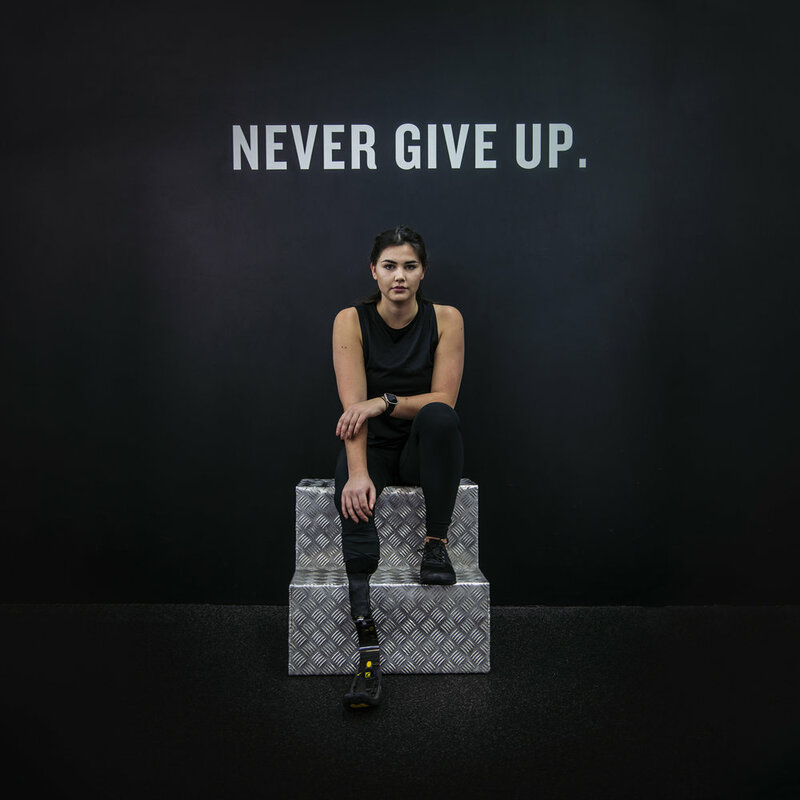 I am using Instagram (jessicaemilyquinn) to start tackling body insecurity through my modelling shoots, and I've just begun my blog limbitless.co.nz. Through my work, I want to reach out to not only those with disabilities, but to anyone living with insecurities. I’ve called this movement Limbitless. You could say I’m determined to challenge what many industries perceives as beautiful. There is no cookie cutter mould for perfection. You seem so confident with who you are and your body image. How did you get to this point and what does being ‘body positive’ mean to you? I remember not wanting to go out sometimes because I was self-conscious. But as I’ve gotten older, I figured that if I’m confident about it, other people will be confident about it too. What is some advice you’d give to young women who feel insecure about their bodies and the way they look? Remember that every single person you meet has insecurities and things they don't like about their body, even the girl you perceive as ‘perfect’ on Instagram has something she doesn't like. We need to get to a point where we aren't constantly trying to fix our imperfections, we need to embrace them, find comfort in the things we love about ourselves and to simply be real. Project the life you live in a way that will inspire others to do the same. You talk about how having a positive attitude can help a lot when struggling with a tough time. What tips can you give to others who want to start a positive inner dialogue? Yeah, this is something I learnt at the age of 9. I am here today because myself and the people around me were so positive through my illness and still to this day. So many situations can become a lot better simply with a positive attitude. The mind is a powerful thing, if you believe you can be something or do something or feel something then you will do it. Case and point right here, growing up I was so upset and frustrated with the hand I’d been dealt but one day I decided to try out being happy with it, to turn it into a positive situation, turns out it's working pretty well and I now truly am happy with my life and the outcome of the things I went through. You have so much going on in your life right now, what do you do to make sure you still look after yourself? I make sure I exercise everyday, eat wholesome foods to nourish my body and get plenty of sleep (mostly because you don't want to see me if I’ve had less than 8 hours sleep haha). Then each week,I try my best to do something for myself. Whether it’s brunch with friends or try out a new exercise class or read a part of a book I enjoy. I am the worst person at relaxing and slowing down but it's something I’m working on at the moment, it’s important to let the mind rest.